With luck the preceding pages have given you a pretty good idea on what kind of beach structure to look for and how to visually spot different varieties of fish in the surf, now it's time to put all of this new found information into practice and go fishing on the beach. 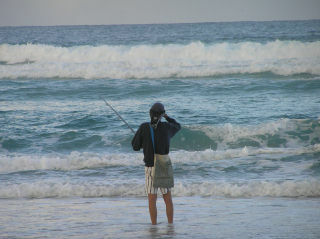 If you intend fishing a beach with 4wd access and have a suitable vehicle all the better, but if you haven't don't despair, walking the beach will allow you more time to search for fish in the waves and maybe discover an interesting looking gutter that seemed plain to the guy cruising past at 40 KM/H plus. We have set out with a loose plan, our major target species is tailor but we also have the gear to take on almost any other species we may encounter. A wander along the beach half way through the ebb tide shows up a very nice looking gutter with great tailor potential particularly as the tide gets high around dusk and set ourselves up there. Between a few quick lunchtime sandwiches we loose a few casts with metals into the suds but produce no early results, but we do spot a small school of large dart out on the bank. A peak through the icebox shows we have bought frozen WA pilchards, fresh gar and mullet we cast netted earlier, but not our first choice baits for dart. Easy fixed on almost the bottom of the tide, several small mounds in the sand indicate the presence of pippis and 100 metres down the beach is a likely looking worm spot where we gather a few fresh beach worms in quick time. Back to our gutter and the line barely hits the water on our first cast with a pippi and the rod bends over almost immediately, a nice dart. This one is followed by 3 more before the school finally moves on. A fun distraction and one that gave a chance to note the effects of the wash on our lines. We have noted current areas where untended lines will quickly wash back into the beach, plus a good section of stationary water that will host a lazy rod in a beach spike. As the afternoon starts to cool we slip on something a little warmer in expectation and preparation for what's to come. Our gutter has become wild with the gentle sea breeze and rising tide, with white water now smashing the outside bank. A few birds can be seen working the outside of the bank just near the outlet to our gutter, a good sign. Time to get serious, a whole gar is placed on a gang of 5/0's we had pre rigged earlier and is launched into the white water of the bank. A few minutes of tending shows the bait is holding its position nicely and is slipped into its beach spike allowing the use of a second rod baited with a pilchard to throw a few speculative casts into other more active sweep sections of the gutter. Walking along the beach slowly with the moving bait keeps it out in the zone and covers a greater distance in our search. A gentle ratatatat followed by a strike brings in a nice chopper tailor of better than a kilo. Several more follow in the same weight range followed by a larger specimen of 2 kilos on a mullet fillet just after dusk, before things go quiet. The chill of the night air has forced you into cold shielding waders and I take my leave to clean our earlier catch of dart. Returning some 30 minutes later bearing freshly cooked dart fillets between slices of bread easily prepared on the little $20 butane cooker in the back of the fourby, puts a smile on your face almost as big the one you had pulling in the 3 kg tailor and 1kg plus bait stealing bream while I was away. Several other spaced captures keep our interest up till roughly an hour after the top of the tide when a deathly quiet falls over our gutter and at 10-30 pm the decision is made to head for the warmth and comfort of home. We have kept two of the smaller tailor, the 3 kg greenback tailor and good bream, the rest having been released after capture, more than enough for a few fresh feeds over the next couple of days. The above is a fairly reasonable scenario when you gain a little experience and commit yourself to putting in the time and effort to fish with fresh well presented baits in likely looking waters. There are a number of points I will summarize and expand on just to ensure they stick in your mind. We arrived early enough to judge the gutter at a similar water level (although opposite tide) to that we were going to fish during the prime dusk period. We reconnoitered during our dart fishing and noted what the rips and washes were going to do with our lines before dark, allowing us to position our equipment and ourselves in their respective prime positions. We maintained a presence at our gear in case a larger fish tried to drag our rods from their holders into the water. We took and gathered a good selection of fresh baits for our primary targets and secondary fish as they appeared. We had a plan but stayed flexible enough that we were able to target another species when one appeared, giving us the luxury of fresh fish burgers on the beach. We had suitable clothing and equipment to keep us comfortable during our extended fishing trip on the beach, something you will appreciate on those long cold winters nights. Check your tide times for the area you are going to fish, as they may vary by as much as 90 minutes from your local area and tide height to ensure there will be sufficient sand left on the beach to ensure your vehicles safety during extended stays in lower beach areas. Don't park on sand dunes and remove any rubbish you generate while fishing or find on the beach. It makes the whole experience that much more enjoyable for all beach users.